Billy Boat has been at the top of exhaust technology for 20 years; every year coming out with something new. B&B comes from a long heritage of racing, and they bring that knowledge right into a completely new state of the art exhaust system for the Camaro! B&B has designed a muffler specifically for the Camaro using their proprietary Purge Resonance Technology or PRT. Hand fabricated out of T304 stainless steel the muffler offers increased exhaust flow and emits a nice deep muscle car bark at idle, acceleration and cruising speeds while all but eliminating the unwanted in-cabin, low frequency resonation. Performance increases of 10hp and 11ft/lbs on the V8 and 5hp and 5ft/lbs on the V6 were seen on their in house chassis dyno with the mufflers only. For aesthetics Billy Boat Performance Exhaust incorporated their popular round double wall tips with a 4.50” on the V8 and a 4” on the V6 to give the Camaro a mean yet distinguishing look missing from the factory. The mufflers and tips are fully polished to a mirror like finish and as with all Billy Boat Performance Exhaust systems it is backed with a limited LIFETIME warranty. CNC mandrel bent T304 stainless steel tubing is used throughout the entire system for a precise fit. The V8 is a full 3” system and is available in a classic and sport version while the V6 is a 2.5” system and is only available in the classic version. Both the V8 and V6 systems use a hand fabricated x-pipe that helps balance the exhaust pulses for better scavenging and a cleaner exhaust note. The Classic exhaust system was the first system from the design team at Billy Boat Performance exhaust. With factory headers and factory catalytic convertors, many customers were asking for a system with more volume. The sport system was born, and is a great choice for customers planning just a cat-back installation. When we installed the long tube header and the hi-flow cat pipes, we find the larger muffler on the Classic system give the exhaust note a deeper, richer tone and would recommend the Classic for a complete system. 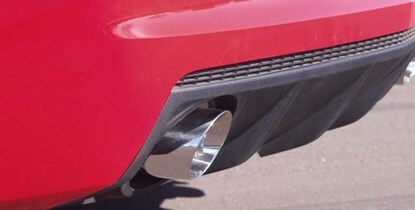 This Billy Boat 2010 Chevy Camaro exhaust incorporates the latest in resonance control technology, B&B’s proprietary Purge Resonance Technology or PRT as it is known. Completely reengineered the PRT system allows you to have a mild exhaust note at cruising speeds yet a forceful note on aggressive driving. The complex yet simple design gives you the increased sound and performance you are looking for with its straight through design on moderate to hard acceleration and then the unique purge chambers cancel out the unwanted interior noise during low rpm cruising speeds. The mufflers use 3" tubing for maximum flow throughout the system.